Tom Angleberger’s Fake Mustache is quite possibly the weirdest book I’ve ever read. Or at the very least, it’s in the top 10. I keep thinking it’s what would happen if director Wes Anderson (Grand Budapest Hotel; Moonrise Kingdom) tried to rewrite Captain Underpants. I love the Origami Yoda books because they’re funny and quirky. 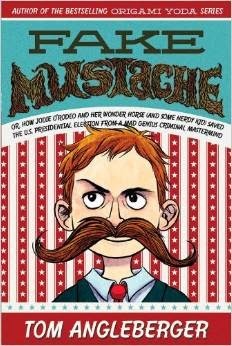 Fake Mustache brings some of those same qualities to the page, but with an added twist of surrealism that takes a minute to really appreciate. More importantly, the premise is so unbelievable that it takes a willing suspension of disbelief to fully enjoy it. But—if you can do that, then the book is a ridiculously wonderful treat full of over-the-top slapstick humor, minor crudity, and wholesale brainwashing. The plot is simple. A boy goes into the local novelty shop, buys a fancy fake mustache, acquires a “man about town” suit, and takes over the world while his best friend tries to stop the madness (and the mimes). Add in one former teen-aged TV star, a foreigner who “sounds like he might be French, but not quite” and a slightly demented novelty inventor (booger guns, anyone? ), and you have a completely ridiculous book custom-made for a middle-school boy. What’s not simple, and is even harder to define, is why it just works as a book. Angleberger has a gift for making completely unrealistic characters and situations believable and oddly charming. At several points during my reading, I would reread passages and wonder “huh. How did we get here?” then keep going because the “how” wasn’t nearly so important as remembering where we were and reading on to see where this thing was going next. This book was so unexpected that I’m struggling to articulate what did and didn’t work for me as a reader. I think it all comes down to being willing to suspend belief in social and natural rules and just go with it. Once I got into it, I really enjoyed it, but it took a couple of false starts before I was in the right mental place to really “get” it. Very cool review, this one just made my "to-read" list. Thanks for the tip!